In an earlier post, “waxing poetic,” I described our unique “woodland home” down here in Lizard Holler. With the privilege of living here comes the equal privilege of the dreaded “power outage.” We have a water well and depend on electricity to pump the water to our home. We also like simple things such as lights, TV, heat, and air conditioning. Knowing a power outage can happen anytime year-round, we keep back-up drinking water, candles, oil lamps, and firewood. We are pretty good at entertaining ourselves until the heat goes out. Most folks here in the mountains have a wood stove or a fireplace. It just “ain’t fittin'” to live here without one. Having either is honorable, and honor is important in the mountains. Firewood, and cutting your own, is also honorable. Owning a chainsaw is right up there with owning a “dawg.” Maggie purchased a chainsaw the first Christmas we shared. It is a well seasoned Poulan chainsaw. Cutting your own firewood serves two very vital purposes. First you can burn it and stay warm. Second you can keep your property clear of debris year-round. The only time our chainsaw lays idle is when it is just too hot outside to “fire that sucker up!” I have included a picture of our “black behemoth” wood stove. Strategically installed on our ground floor, it keeps our toes toasty warm on cold Winter nights. [You are probably asking where is the stove door? 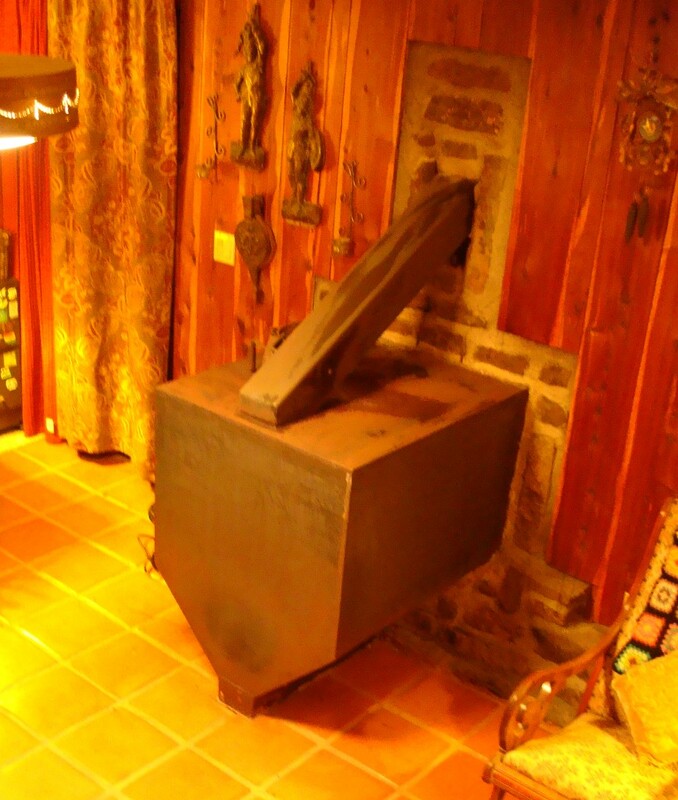 We feed our stove from outside, thus keeping our interior tidy from wood debris and critters that hide in the woodpile.] Moral to my blog today is, cutting your own firewood is like making your own bread or brewing your own beer. It is honorable. Haikus are also honorable. Here are two I penned this past Winter. This entry was posted in Flora and Fauna, Folklore. Bookmark the permalink. Gotta love a woodstove . . . and the man who cuts the wood–and still finds time to ku! end of winter . . . Yes! I remember telling sister, don’t even think about getting rid of that “ugly stove.” In fact, get it fixed and you’ll thank me! You did a splendid job of fixing it — better late than never;) Glad to help — esp. since I didn’t have to climb on the roof or split the wood. Good advice is what I do best! It does give the lovelist heat on a frosty day.